Osteoarthrtis is degenerative in nature; considered chronic destruction of the articular cartilage of the joint. As cartilage is worn down, bones within the joint rub together, causing pain, swelling and stiffness. 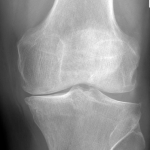 Initial symptoms of osteoarthritis usually occur in middle-aged patients, and are common in the elder population. Factors such as being overweight, genetics, previous trauma or long-term overuse of a specific joint in athletics or a professional setting can lead to progression of osteoarthritis. There is no blood supply associated with articular cartilage, rendering the body incapable of repairing cartilage damage on its own. Early treatment for osteoarthritis is often non-surgical. Recommended conservative treatments include weight loss, activity modification, anti-inflammatory medications and physical therapy to strengthen the muscles surrounding the joint. If conservative measures render unsuccessful, injections (cortisone, synvisc) may be used to reduce symptoms. Once all conservative measures have failed, patients may qualify as candidates for knee replacement. Dr. Domb is pleased to manage osteoarthritis during the conservative management stages.